How can texture transparency make my model look better? Is there a shortcut to making my model’s clothes fit better/look better? Can I make my model’s skin invisible in places where it looks weird against the clothing? How do I make a part of a model’s texture be invisible? Fixes Clipping In the Shoulders! For me, the shoulders are one of the most difficult areas to get right on a model. Due to the shape of the mesh in that area, simply removing parts of the mesh that are problematic can result in mesh being cut from the neck hole. Certain types of clothing make the problem worse. When I was making a model with a hospital gown, I ran into a problem. The mesh for the gown and the shoulders didn’t line up, meaning the neck hole would have gaps in it. There had to be another solution, a way to remove the mesh at specific points rather than relying on the points on the model. The answer was to use texture transparency to make the troublesome parts of the model look invisible. Note that I am assuming you know the basics of PMXE and how to use your image editor of choice… like GIMP, Photoshop, etc. This file probably looks different than yours. I modified the model’s skin tone to make her look sick. Can you tell where the shoulders are on this model? Neither can I! The texture is very compact, so it’s harder to tell exactly where the seams are. I decided to experiment with the texture image to discover what went where. I overlayed a couple of gradients over the basic texture to see where the seams are. You could probably also use a grid or checkerboard image to do this. Okay, it’s between the body and the elbow. Once you figure out where the area you’re working on is, make a new layer. Draw on the area in an obvious colour. My texture is pale, so I’m using black. Don’t try to erase the texture yet. You might have selected an incorrect area. That’s not quite right. I had accidentally selected the knees… and not all of the area I want to remove is blacked out. 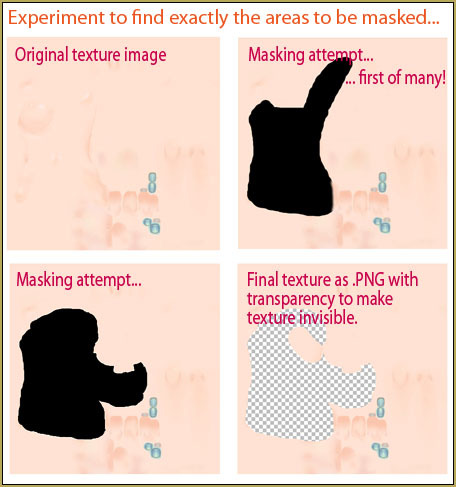 Erase the area where you don’t need the texture removed and re-load the texture. You can keep trying until you get the area right. Be as specific as you want. It can take many tries to get this right. It took me, like, nine tries, adjusting the texture each time, until I was satisfied. Now you can make the final texture image with the transparent parts. I made it transparent using a layer mask in the image editor. This means that I can edit the transparent area. Save it as a .png file. The original file was a TGA file… but TGA files do not use transparency, so if you save it as that file-type, it won’t work. A test in MMD should confirm it looks good. You can change the transparency to .99 too. You can also delete the vertices that are obviously hidden by transparency to make the model easier to load. Miku: Hey, my feet have been feeling odd since you made my shoulders transparent. Me: Oh, yikes! We’re definitely going to need to fix that. I could edit the texture again to put the part of the foot texture that I removed back, but I’m lazy. Instead, I split the feet from the body mesh and replaced the texture with the hole in it with the original texture. Is this the best way to solve this problem? I’m not sure. In fact, I suspect this article has made LearnMMD’s more experienced PMD editors very, very sad. It’s really just a bodge, an improvised solution. For me, it works. 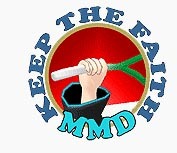 Keep the Faith! Hospital Miku is made with Simple Gown and TDA Miku Base. I used information from bandage’s Use the PMXE Transform Window to edit your MMD models! 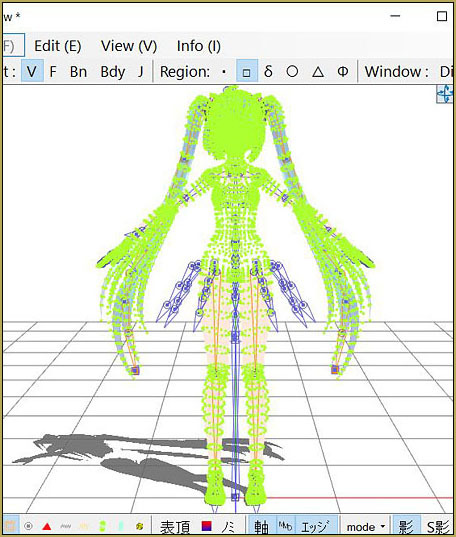 and bigperryman’s PMXEditor Quickly Edits MMD Model using Downloaded Parts, among others, to make the model. 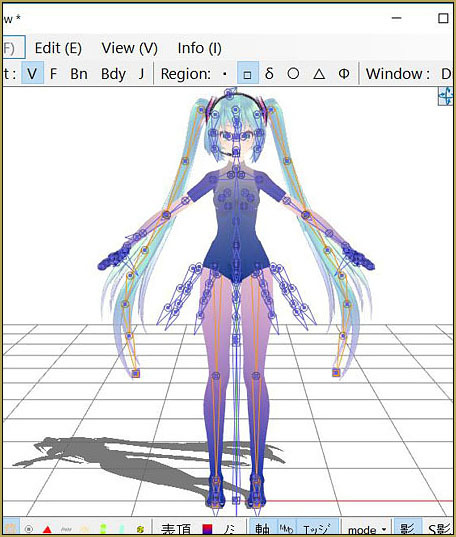 Have fun with PMXE and MikuMikuDance! How come when I load all the parts to the PMX editor and then save it, it turns all white in MMD? You must gather all the parts (and more important, all their textures) in one folder before assembling.